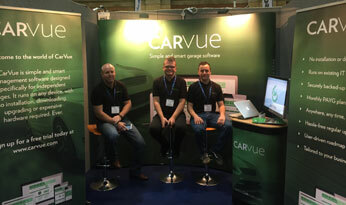 CarVue is a new and innovative cloud-based workshop management system available to UK workshops. It’s been designed from the ground up as a simple and smart, all-in-one management solution for the independent aftermarket sector. CarVue gives workshop owners a single view of their entire business, and at its core are modules that enable smart management of contacts, vehicles, job cards, diary and accounting. It’s a simple and comprehensive application that can rapidly improve day-to-day workshop processes, with smart and evolving features designed to keep garage owners on track in the rapidly changing aftermarket landscape. CarVue has been built to work on mobile phones, tablets, desktop computers, diagnostic machines – in fact any of today’s web-enabled devices – and is fast and intuitive for anyone to learn to use quickly. From signing up via the website up to adding a contact, vehicle, job card and emailing an invoice to a customer can take less than five minutes. Help is always at hand with a simple set of training courses designed to get a business up and running very quickly. In addition, there’s an interactive knowledge-base of help articles and videos, as well as a live chat facility built in to ask the support team any question. The system is really flexible and customisable, with a wide range of settings and templates available to tailor it to every workshop. Garage owners are able to rapidly put in place professional practices, accounting and communication audit trails that enhance business perception to customers and suppliers. A comprehensive set of financial reports and exports sits within the reporting module to give business owners instant insights into how their workshop is performing. CarVue is a departure for garages used to high up-front hardware installation, training and maintenance costs associated with traditional server-based systems sat physically in a workshop. With no hardware to install, maintain and pay for, you’re always running the latest version of the software, removing the need to install or download updates. Moreover, as an online service, backups, security and data recovery are automatically handled by the system. The community of users actively participate in the evolution of the product. Users suggest ideas and integrations, and then vote on their favourite features, with the most popular ideas becoming incorporated into the application. It’s a democratic process that makes CarVue unique, with every user having a voice and a say in what makes it into the app, for the benefit of all. Following a free 30 day trial, CarVue is available in monthly packages to suit a wide range of businesses and budgets. For more details, visit www.carvue.com.